Summary: Easy steps for converting Adobe PDF, Word, or text documents to Amazon Kindle format (with Pictures). 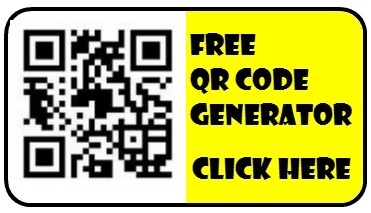 Instructions to convert Adobe PDF, Microsoft Word or Text documents to .MOBI or .PRC format for eReaders, electronic Readers. My friend, Steve, has been considering buying an Amazon Kindle for the past several months. However, he needs an eReader that can display PDF files. The Amazon Kindle DX currently has the largest screen of any eReader allowing it to display Adobe PDF files in their native format. I wrote about the problems with displaying PDF files on the readers in my blog post at this link. Step 1 Step 1: After starting the MobiPocket creator software,find the “import from existing file” section, and click on the link for the type of files you’d like to convert Amazon Kindle format. you can use Mobipocket creator to convert HTML, Microsoft Word documents, or text documents, or Adobe PDF files Amazon Kindle format. 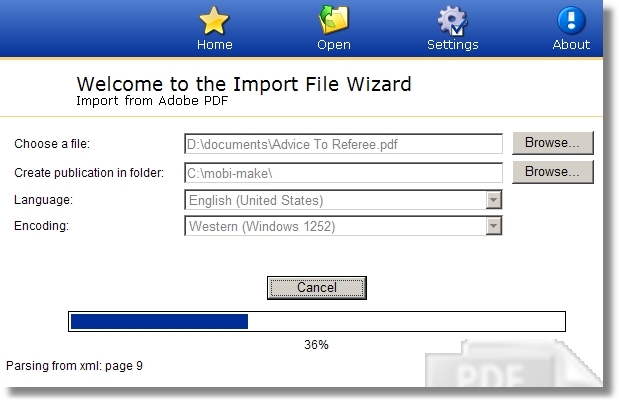 Step 2: When the MobiPocket Creator import file wizard screen appears,use the browse button to select the file you wish to convert, then click the OK button. 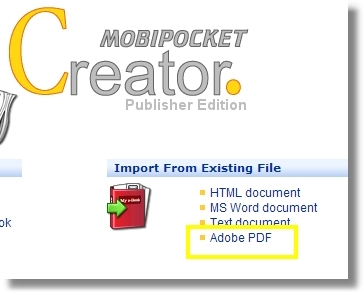 Step 3: MobiPocket Creator create HTML files from your Adobe PDF or MS Word or text document. 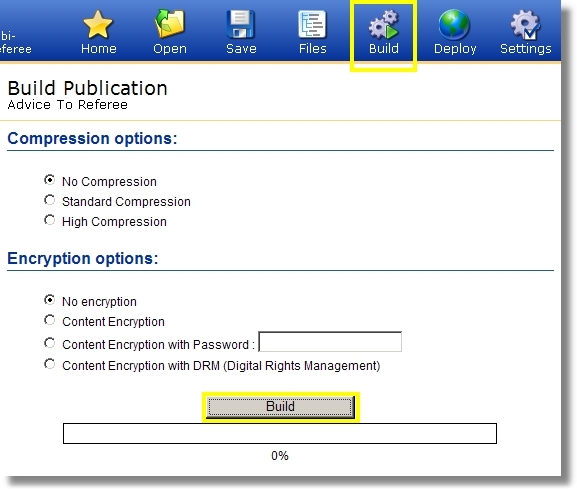 Click the “Build” button to perform final conversion and Build an Amazon Compatible version of your original document. Step 4: When you convert your Adobe PDF or Word Document to Amazon Kindle Format, you can choose compression and encryption options. After setting conversion options, click the “build” button. Step 5: The build, converting PDF or Word to Amazon Kindle format only takes a few moments. If a problem occurred during conversion, the details of the errors will be displayed at the bottom of the screen in the “build details” section. 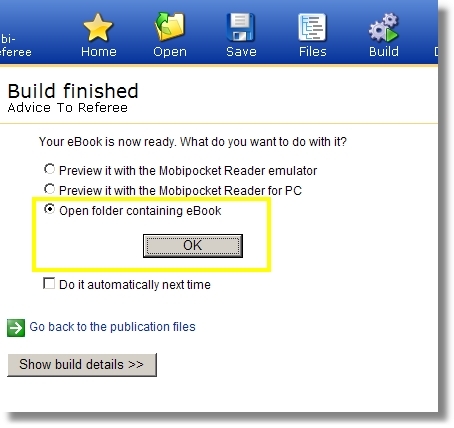 Select the option to “Open folder containing eBook” then click the “Ok” button. Step 6: The folder containing the eBook may also contain your original document, and the HTML version of your original document that was used to convert PDF to eBook format. The converted version of the file will be desplayed with “eBook” in the “Type” column and it will have a .PRC file extension. Note that the eBook file is always smaller than the PDF file. 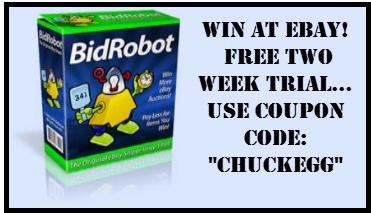 The eBook (.PRC) file also works more quickly than PDF files and is text searchable. Step 7: Connect your eBook eReeader to your computer then drag (or copy) the newly converted eBook (.PRC) file from your computer’s hard drive to your eReader device. Disconnect your eBook eReader device and the new eBook should appear in your book’s listing of installed eBooks.